Baking soda for gout is often pushed as a natural gout treatment. But, it isn’t natural. Because it’s a dangerous chemical that has serious side-effects, even under medical supervision. Here, I explain the dangers of baking soda for gout. Then I describe better, safer alternatives to baking soda when treating gout. Baking Soda and Gout is NOT Natural. Baking Soda & Gout Summary. Your Gout & Baking Soda. Baking Soda for Gout References. 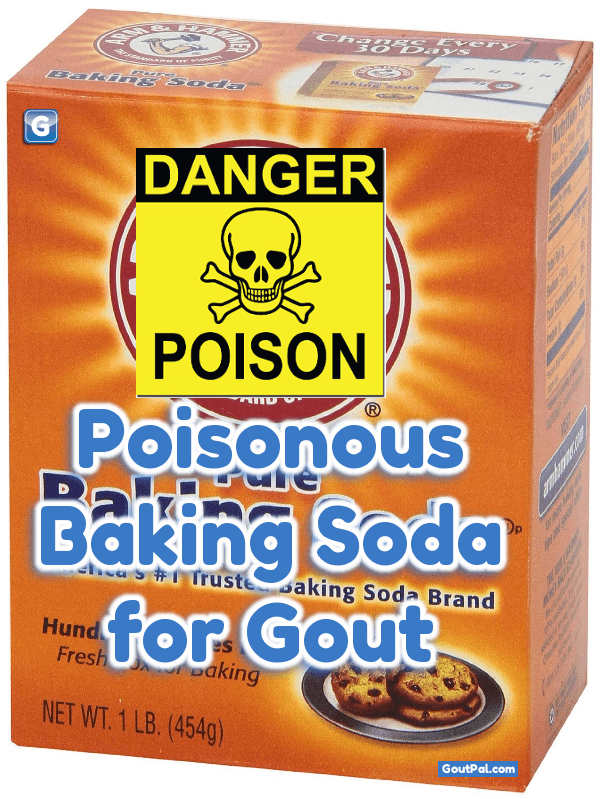 When I first started GoutPal, I was aware that some people pushed baking soda for gout. 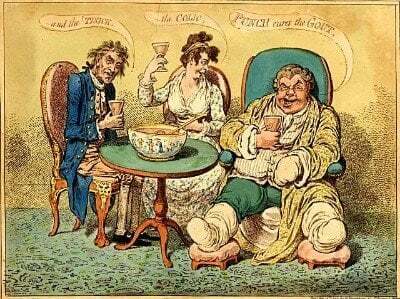 They pushed sodium bicarbonate as a home gout remedy. At the time, I had suspected high blood pressure. So, I chose to avoid baking soda. Because it is well known that excess sodium raises blood pressure. Besides blood pressure, I’ve seen other warnings. Baking soda brings as many problems as benefits. I had to avoid the risks to my blood pressure. I hated the idea of taking an untested chemical every day. My biggest benefit came when looking for alternatives to baking soda for gout. So, I researched natural ways to alkalize. Then, I was pleased to discover Alkalizing Gout Diet Menu. Because alkaline diets use healthy food to help control uric acid level. Subsequently, research has shown specific gout benefits. Because a naturally alkalized body will excrete more uric acid. So, it’s easy to achieve lower uric acid with tasty diet changes. Why risk your health with baking soda? Recently, I’ve seen claims about baking soda being good for gout in my gout forums. So, I looked at daily sodium bicarbonate more closely. It’s frightening! Because it shows that the baking soda gout myth is dangerous. Self-treatment can mask serious conditions. It might delay urgent medical attention. Label indicates maximum use is 2 weeks. After that, consult a doctor. However, 2 weeks may be too long. Some health problems need immediate medical care. Many patient groups should avoid baking soda completely. These include alcoholics and people taking diuretics. Baking soda if misused in excessive amounts can result in serious acid/base and electrolyte imbalance requiring medical treatment. Patients often exceed the doses recommended on the product label, but adverse side effects were also noted when the recommended doses were administered. depression, and severe breathing problems that can be fatal. Low potassium, which can lead to constipation, fatigue, muscle cramps, palpitations, and weakness. In severe cases, there are many problems including heart and breathing problems. Reduced calcium in the blood that can lead to numbness and muscle spasms. Also, in severe cases, these spasms can fatally affect heart and breathing. A heart condition that can lead to life-threatening irregular heartbeat. Finally, using baking soda can delay essential medical care. So, this is especially significant for gout sufferers. Because uric acid crystals that cause gout attacks are dangerous. Therefore, masking gout symptoms with baking soda is very bad for your health. Because, left untreated, uric acid crystals will destroy joints. Also, they damage heart, kidneys, and all other organs except the brain. In conclusion, you now see the dangers of baking soda for gout. So, I’m sure you’ll want to avoid it. But, what are the alternatives to bicarbonate for your gout? I’ve mentioned alkalizing diet for gout. Because it is helpful in encouraging excretion of uric acid. Also, it works best in conjunction with an effective uric acid management plan. So, you should ask your doctor about treatment to lower uric acid as soon as you can. Your gout management plan needs to be tailored to you. So, you and your doctor must consider your history, aspirations, and medical needs. But, you are not alone. Because I can help you know what questions to ask your doctor. Then I can help you understand your doctor’s advice. Do you want personal help to control uric acid safely? Then, just ask in the gout forums. Finally, if you want more information about effective gout treatment, please see my Gout Treatment Guidelines. Al-Abri, S. A., and T. Kearney. “Baking soda misuse as a home remedy: case experience of the California Poison Control System.” Journal of clinical pharmacy and therapeutics 39.1 (2014): 73-77. Adeva-Andany, María M., et al. “Sodium bicarbonate therapy in patients with metabolic acidosis.” The Scientific World Journal 2014 (2014).